Uganda was last week nominated to the Board of the International Training Centre (ITC) and designated as the official spokesperson of the Africa Group on Social Dialogue in the governing body of the International Training Centre based in Turin, Italy. ITC is the training arm of the International Labour Organisation (ILO) and provides high-level in-service training for governments, employers’ and workers’ organisations as well as other national and international partners. It also offers Master Degree Programmes in Labour Economics, Occupational Safety and Health and Industrial Relations, among others. The Board to which Uganda has been appointed is the highest policy and decision-making organ of ITC. In its capacity as official spokesperson, Uganda will be responsible for presenting Africa’s position on matters relating to economic and social policy. The nomination comes just few days after Uganda was unanimously elected to the ILO Governing Body. Uganda was on Monday June 12, overwhelmingly voted to the Governing Body of ILO by the ongoing 106th International Labour Conference in Geneva for the period 2017-2020.Uganda was first nominated by the Africa Group at the African Union meeting held in April 2017 in Algiers, Algeria. 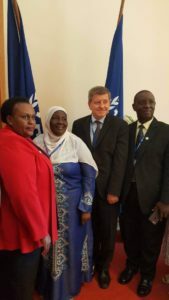 As a member of the governing body, Uganda will play a key role in determining ILO policies, budgets and programmes all over the world as well as the election of the Director General of the ILO. The Uganda delegation at the conference was headed by Gender minister Janat Mukwaya, Permanent Secretary Pius Bigirimana, Uganda’s Permanent Secretary to Geneva Christopher OnyangaAparr, Executive Director Federation of Uganda Employers Rosemary Ssenabulya and Secretary General National Organisation of Trade Unions Peter Werikye, among others.